The U.S. Army Corps of Engineers is in the initial phase of studying selected munitions response sites within the Former Waikoloa Maneuver Area, a Formerly Used Defense Site in South Kohala, Hawaii. The purpose of the study is to determine the nature and extent of munitions, unexploded ordnance, and munitions constituents potentially present within the sites. The study, a Remedial Investigation, consists of surveying the area with a metal detector that can record information under the ground surface. The Remedial Investigation is not a clearance action; rather it is data collection of the contamination that might be at the site. The Feasibility Study is a study to determine what action, if any, is warranted based on potential risks to human health and safety. The Remedial Investigation/Feasibility Study allows the Corps to gather data about potential risks and to make an informed decision on how to proceed. It is important to note, that properties will not be investigated in their entirety. Only a portion of each parcel will need to be investigated and most steps in the process are not intrusive, so impact to residents is anticipated to be minimal. To properly investigate the area, up to 5 visits to your property will be necessary. Effective communication and coordination is the key to ensuring a successful investigation that meets the project goals, while minimizing impacts to the residents. Securing groups of properties in close proximity to each other, will be beneficial to streamline the data collection and intrusive activities. Method: The survey team will consist of a qualified archaeologist/biologist and an Unexploded Ordnance (UXO) Technician. The team will walk throughout the property to visually assess any potential areas of concern. This information will be incorporated into the subsequent steps of the remedial investigation for avoidance. Status/Timing: The Cultural and Ecological Resource Surveys have been started in the southern portion of the site. We anticipate the surveys will be ongoing though December to cover the entire site. Purpose: To ensure the path for geophysical mapping is free of vegetation at a height of 6 inches above ground surface. Resident Impacts: Residents can be home during the brush clearing, but are not required to be present. Method: The brush clearing team will consist of two UXO Technicians. The team will follow the predetermined paths and cut vegetation only where necessary. No brush clearing will be conducted without prior resident approval. If brush clearing is required, the width of vegetation cutting will not exceed 2 feet. Duration: Should be completed in 1 to 3 days depending on the size of the property and density of vegetation. Status/Timing: The brush clearing in this area has started. We anticipate the brush clearing will continue through December, as needed. Purpose: To determine if there is buried metal on your property that could potentially be a munition item. Resident Impacts: Residents can be home during the geophysical mapping, but are not required to be present. Method: The geophysical mapping team will consist of an instrument operator and an UXO Technician. The team will walk cross a portion of your property following predetermined paths. Data will be collected using a hand-held metal detector kept at a height of approximately 6-inches above the ground surface. Each metal object recorded with a location coordinate from a high precision Global Positioning System unit. The geophysical mapping will not be conducted within buildings, structures or paved areas. Duration: Each property should be completed in 1 to 3 days depending on the size of the property. Status/Timing: The geophysical mapping in this area has started. Coordination efforts are ongoing to prepare large blocks of properties for geophysical mapping to minimize impacts to Lessees and increase efficiency of data collection. Purpose: To determine if munitions are present on your property. Resident Impacts: As a safety measure, residents may need to evacuate the property during the Intrusive Investigation. Accommodations will be made for residents displaced from their homes during the day. Method: The Intrusive Team will consist of an instrument operator and multiple UXO Technicians. The team will return to locations where items were identified during mapping phase to dig them up for further investigation. The teams will dig with shovels and other hand tools until they can visually observe the item and determine if it is a buried munition. All metal objects will be removed and disposed of at an off-site facility. If a buried munition is identified, it will be detonated onsite after coordination with local emergency management officials and all proper safety measures have been taken. All areas impacted by the investigation will be restored to their original condition. Duration: Dependent upon the number of buried items identified. Based on the mapping information, we should be able to provide an estimated time frame for each property when the coordination call for intrusive investigation step occurs. Status/Timing: The intrusive investigation in this area has not started. We anticipate the intrusive investigation in this area will occur in early 2017. 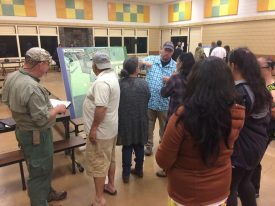 U.S. Army Corps of Engineers, Parsons Brinckerhoff and Department of Hawaiian Home Land officials discuss the ordnance removal process with Hawaiian home beneficiaries. In an effort to minimize impacts to residents while conducting the Remedial Investigation activities, Parsons will ensure direct coordination occurs with each resident prior to entry. For the initial access notification to a property, Steps 1 through 3 outlined below will be followed. For all subsequent activities, Steps 2 and 3 will be followed. Approximately 2 weeks in advance, initial notification from the Department of Hawaiian Home Lands to indicate the Remedial Investigation process in the resident’s area is about to start. Approximately 1 week in advance, Parsons’ will conduct a follow-up call to discuss the specific timeline planned for the area and confirm it is acceptable with the resident. The day before property access is planned, Parsons will place a reminder call to the resident. If a conflict arises and the date must be changed, the resident is asked to call (808) 339-0394 at their earliest convenience and leave a message with the resident’s name and address (also TMK, if available).